Warning: This contains a lot of spoilers! Seven million people tuned in to the fourth episode of BBC One's drama Bodyguard on Sunday - and the political thriller has left viewers guessing about what's really going on in a way that hasn't been the case with many recent shows. 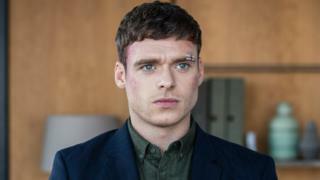 In Sunday's episode, DS David Budd (played by Richard Madden) tried to deal with the aftermath of a bomb during a speech by Home Secretary Julia Montague (Keeley Hawes). And one major plot twist in particular has generated conspiracy theories. The show revolved around Madden's and Hawes' characters - but on Sunday, viewers were told Hawes' home secretary was killed in the bomb. The show's creator Jed Mercurio - who was also responsible for Line of Duty - told Radio Times viewers would never see her death coming. "I like to try to do things that move the story on," he said. "With Bodyguard I wanted to have this event mid-series that would completely alter the dynamic." Growing up, he struggled to believe in TV drama because he knew the central characters wouldn't die, he said. "I remember watching TV as a kid and, whenever there was some sort of jeopardy involving the hero, I could reassure myself that they were what I'd call a 'can't-die' character, so everything would be OK."
Hawes herself thanked fans for their reactions on Twitter. It's highly unusual for a drama to kill off one of the central characters halfway through. "It's a real shock because the whole show, the whole advertising, the whole talk about this entire drama has been the dynamic between her and the bodyguard," Buzzfeed TV editor Scott Bryan told BBC Radio 5 Live. "And then, in episode three - not a pivotal episode in a normal run of things - to kill off your main character is a bold, bold move." Sarah Hughes from The Guardian said echoed those thoughts, writing: "The death of Home Secretary Julia Montague at the drama's half-way point was a bold move, but I'd argue, despite the hole it now leaves, a brilliant one." We know from Line of Duty that Mercurio is the master of the plot twist - Hawes was in series two and three before being bumped off in that too. It's unusual for shows to unexpectedly kill off a major character - although it happens, like with Lisa Faulkner in the second episode of Spooks, or Sean Bean's Ned Stark in the first season of Game of Thrones. But it's even more bold when a show centres so closely around two people. Was Montague's death fake news? However, a lot of viewers are finding it hard to believe Montague is really dead, especially when we haven't seen her body on screen, and there are plenty of theories about whether it might all be some elaborate cover-up. "I don't think she's dead," critic Joe Michalczuk told 5 Live. "I think it's too bold. We haven't seen the body. I'd be gobsmacked if she doesn't come back." One theory suggests Bodyguard may actually be a modern re-telling of Romeo and Juliet - with some pointing out that the names Julia and Montague could be derived from Shakespeare's play. In the play, Juliet fakes her death, with Romeo - unaware of her true plans - decides to join her, drinks poison and dies. Juliet then wakes up and kills herself. Will Jed recreate this tragic ending? Scott Bryan thinks that might be a twist too far. "I think [Julia being alive] would be a bit loopy, even for Jed Mercurio levels - and he's known for making massive plot twists - for it to make sense that she isn't dead." There are lots more questions to be answered beside whether Julia is alive or dead, all leading to some elaborate conspiracy theories. Why was Julia's sacked aide Chanel driven off in a sleek car with a bloke who was spotted at the army veterans group? And why was there a figure who looks a lot like her standing in the wings during her speech? Did Tahir really set the explosive device off? Fans have pointed out that if you re-watch the sequence, the bomb actually comes from under the stage. And what was in the briefcase? Who is Vicky's elusive boyfriend? And whose side is David on anyway?? Image caption Could Budd be Madden's Bond audition? While the mysteries of the first season are yet to be solved, that's not stopping the show's creator from thinking about the future. But he tells Radio Times he's slightly worried that the first series may make Richard Madden too big a star to appear in a second. The former Game of Thrones actor has even been touted as the next James Bond. Mercurio said: "He's the genuine article, a real leading man. And I think this role has put him very much in the spotlight for bigger things." Talks with the BBC about a second series are unlikely to happen until the first season has finished. "You have to wait until the end because anything can happen," Mercurio said. "Some shows do nosedive at the end, or some piece of content could become incredibly controversial and affect the way the show is seen. In the end, you have to accept that the broadcaster holds all the cards." There are two episodes of the first series left - and as we have seen, anything could happen.